Trainer John Bary found the answer he was looking for when promising stayer High Spirits scored a decisive win at Trentham on Saturday. 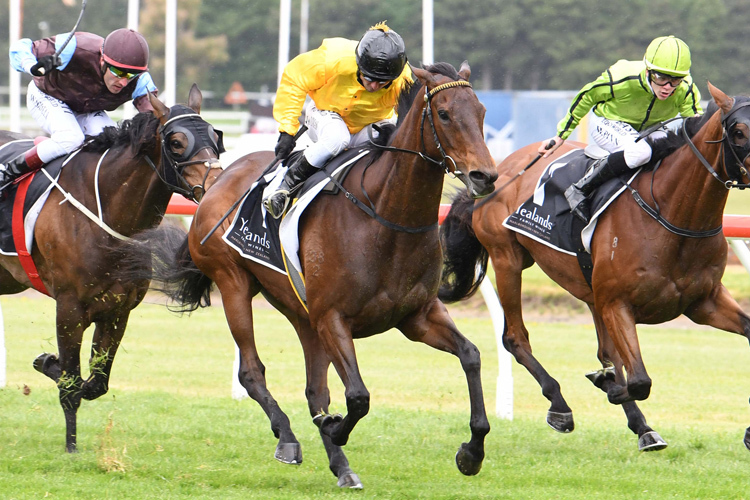 The lightly framed mare had been good without setting the world on fire in her three runs at the recent Hawke’s Bay spring carnival as Bary plotted a path towards a start in the Gr.3 Christchurch Casino New Zealand Cup (3200m) at Riccarton next month. Bary asked rider Cameron Lammas to take a measured approach at the business end of Saturday’s 1 1⁄2 m contest with the visiting Matamata jockey fulfilling the request to perfection as he guided the Darci Brahma mare through a maze of runners in the home straight to grab the victory. “We spoke about not going at the 3 f like we have done in her last couple of runs,” Bary said. “He had her a bit further forward and got a good drag along. “We will probably get a couple of kilos for it but at the end of the day we get the points, we get a start, so bring on Riccarton,” he said. Bred at Blandford Lodge by the Bax family, High Spirits was an $80,000 purchase by Bary from their 2014 Premier Yearling Sale draft at Karaka. The victory was her fourth from 27 career starts. TAB Bookmakers reacted to the win by tightening the mare in to an $8 second favourite in their Fixed Odds market for the New Zealand Cup with Gorbachev ($21) and Bee Tee Junior ($10), who filled the placings behind High Spirits, also featuring among the fancied candidates for the two mile contest.